Who’s Messin’ With My Taste Buds? How long does it take to eat a raisin? We found out one night at a mindfulness workshop. Our yoga instructor friend was the presenter. She started by giving us one raisin each. We noticed its wrinkly contours. Even the tiny sensation of its weight in the palm of our hands. Then we finally got to put it in our mouths. Our goal was to be sure to take three minutes to chew it one hundred times. It was an exercise of painful enlightenment. The taste of that raisin was mind-blowing! It was like eating a raisin for the very first time. No, you don’t need to eat this way! We’re reminding you to stay in touch with the simple pleasures of natural foods. Your body has a feedback loop regulating your nutritional intake. It starts with a sensation of flavor, and ends with a feeling of “satisfaction”. This works best when you stay in the realm of natural foods. Beware the trappings of “convenience” foods. They come from the multi-billion dollar research budget of the food industry. Their intention is to design food that overrides your tongue’s innate wisdom. They want to lead you astray from the simple foods of nature. They turn your “nutrient density” detector into an addiction trigger. Your tongue starts to work for the enemy as a double agent. Their goal is to keep coming back for more “hits” of empty nutrition. Every food additive sends false signals to your tongue. We could imagine a whole book called “Who’s Been Messing with my Tastebuds?” Or its sequel – “90% of The Modern Grocery Store is a Vast Wasteland of Empty Calories.” The sophistication of this food science is quite a sight to behold. These clever scientists are always finding new ways to artificially trigger your “yum!” response. Yet without the nutrient density to go with it. Nutrient density only eats into their profit margins. Natural eating habits do not lend themselves to high profits. Think of your local grocery store as the testing laboratory. Most of the “food” in the grocery store is part of a grand experiment in addiction and profit. Your tongue and wallet are the targeted guinea pigs. Your food addictions and compulsions are their success. The food industry needs loyal, repeat customers. Hormone disruption is an unfortunate casualty along the way. True nutrition is not the name of this game. What happens when your tongue becomes dependent on artificial stimulation? Its ability to detect nutrient density weakens. You lose sight of what you’re putting in your mouth. Are you consuming any GMOs, additives, fillers, or flavor enhancers? Worse, have any of these ingredients become habitual? It’s very easy for addiction to trump intuition. 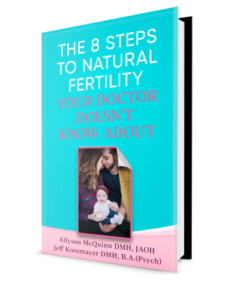 Stay true to your fertility plan. Choose natural foods originating as far as possible from food engineers and marketers. Let your tongue do what it does best – detect nutrient density. Keep it away from addictive sensations. Real food enhances your health. It should never provoke side effects. It is meant to make you healthy, and fertile.